Taxonomy: Nerite Snail belongs to the Kingdom Animalia, Phylum Mollusca, Class Gastropoda, Family Mytiloidae and Genus Nerita. Scientific names: The scientific name of Nerite Snail is Nerita species. Other common names: Nerite Snail is also commonly known as Zebra Nerita or Nerite Snail, Green Nerita or Nerite Snail and Olive Nerita or Nerite Snail. Origin or natural range: Nerite Snail originates from the Indo-Pacific region and the Caribbean Sea including Florida and the Gulf of Mexico. Size: Nerite Snail grows up to an approximate size of one inch. Female Nerite Snails are larger in size as compared to their male counterparts. Color: Nerite Snail occurs in Black, Brown and Green Colors. Aggression: Nerite Snail is non-aggressive towards the marine aquarium invertebrates. Compatibility: Nerite Snail is reef compatible. Habit & Habitat: Nerite Snail is Diurnal in habit and therefore, is active during the day time while, it relaxes at night. Hardiness: Nerite Snail is very hardy. 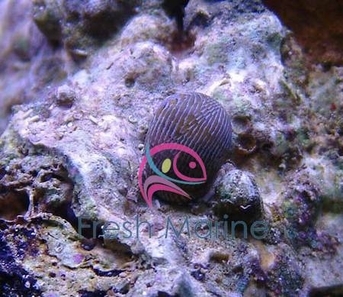 Nerite Snail has a circular shell with varied colors and the patterns of spots and stripes. The shell appears Green in color if Coralline Algae covers it. Nerite Snail is unisexual. Other than size, there are no other morphological distinguishing sexual features in Nerite Snail. Tank type: To host Nerite Snail, you should have a Reef Type Marine Aquarium with a minimum water capacity of five gallons. Keep Live Rocks and vegetation in the reef tank hosting Nerite Snail. Give ample space to Nerite Snail to hide and to search for food. Stocking: Keep one Nerite Snail per 2.50 gallons of marine aquarium water. Temperature of water: Maintain the temperature of your reef tank water between seventy-five and eighty-four degrees Fahrenheit. Specific gravity of water: The specific gravity of water should range within 1.020 to 1.025.
pH of water: 7.00 to 8.50. Aquarium disposition: Owing to its small size, Nerite Snail does not disturb corals or vegetation in your marine aquarium. Diet: Nerite Snail is Herbivorous in feeding habit. Food content: Nerite Snail eats phytoplankton, especially algae, Cyanobacteria, Diatoms, Film Algae and vegetable bits. Supplement the food of Nerite Snail with the small bits or the flakes of cucumber, blanched spinach and lettuce, and corgette. Add Calcium as dietary supplements for the shell growth of Nerite Snail. Breeding: Nerite Snail does not breed in captivity. Nerite Snail is an algae-eater and thereby keeps your aquarium free of algal infestation. Nerite Snail is easy to maintain. Nerite Snail feeds on vegetable bits. However, they do not finish everything introduced. Therefore, you will need to remove the uneaten organic food particles per twelve hours to prevent their decay in your marine aquarium thereby regulating the water contamination. A pH value of water below seven may corrode the shell of Nerite Snail. Do not keep Nerite Snail and aggressive marine invertebrates such as, crabs, crayfish, puffer fish and other large aggressive fish to name some, in the same marine tank as the these animals may eat the snail. Copper and Nitrates in any form in your marine aquarium may prove lethal for Nerite Snail. Caution: Nerite Snail may some times crawl out of your reef tank.